It’s such a horrible shame that Mary Ann Shaffer died in 2008, because I swear I’d run out and buy every book she ever wrote. I’ve read this before, back in 2009, but I loved it just as much this time round. I’m going to try not to gush about it, but just keep in mind that I actually had to stop myself from nuzzling the damn thing at one point. It’s 1946 and Juliet Ashton can’t think what to write next. Out of the blue, she receives a letter from Dawsey Adams of Guernsey – by chance, he’s acquired a book that once belonged to her – and, spurred on by their mutual love of reading, they begin a correspondence. 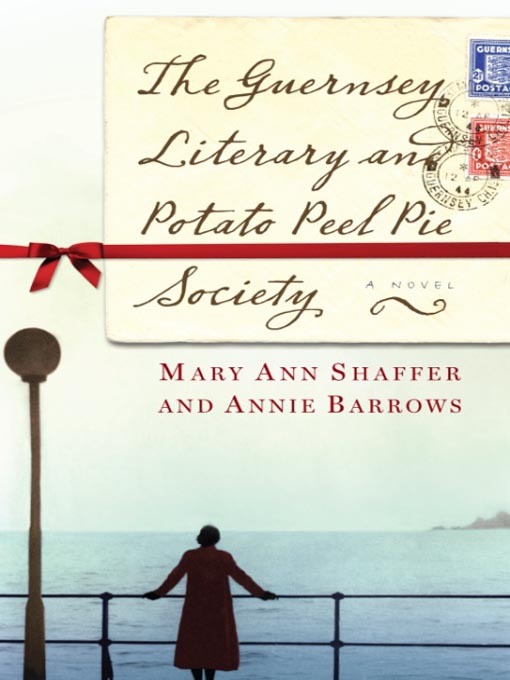 When Dawsey reveals that he is a member of the Guernsey Literary and Potato Peel Pie Society, her curiosity is piqued and it’s not long before she begins to hear from other members. As letters fly back and forth with stories of life in Guernsey under German Occupation, Juliet soon realizes that the society is every bit as extraordinary as its name. If you’ve read 84, Charring Cross Road by Helene Hanff, this is very similar. If you haven’t… well, what’s wrong with you? It’s written in epistolary form – a collection of letters between an author and the members of a book group on the island of Guernsey. Eventually Juliet goes to visit her new friends and writes back to her closest friend and publisher in London to keep him updated on the Guernsey happenings. As the letters progress, more and more of the island’s life under Nazi occupation is revealed – the rationing, the hiding, the beatings… for such a cute little book, it’s very brutal in places. I think that’s what makes it’s so wonderful. It’s so quaint in a chattering, friendly way but it doesn’t sugar coat the true horrors of the War. The way the islanders all banded together to survive and keep up their spirits is truly moving. I’ve never seen such wonderful characterisation in a book – they all have their own personalities and that’s a hard thing to achieve in epistolary form. I especially like the Benoit sisters – a very, very minor part in the book, but it amused me no end. And Elizabeth, oh Elizabeth. That’s all I can say without giving anything away, but if she were real I’d spend my days tracking her down so I could hug her and cry on her shoulder. Honestly, Juliet, she had those children crying and sobbing as though their hearts were breaking. I was too shocked to move, but not Elizabeth. No, quick as an adder’s tongue, she grabbed Adelaide’s arm and told her to SHUT UP. Elizabeth, she got a look that would turn the devil to stone, and then she slapped Adelaide right across the face – nice and sharp, so her head wobbled on her shoulders – and dragged her over to the door, shoved her out, and locked it. Old Adelaide kept hammering on the door, but no one took any notice. I love how Juliet comes to be accepted by the inhabitants of Guernsey as one of their own, and how even Kit goes to stay with her. I can’t really explain the homely feel of this book, you really must go read it. It gives you such a warm fuzzy feeling when you think you actually know these people. Their pain is your pain and their joy is yours. I’ve just been reading the notes at the back of the book, and apparently the real story isn’t that dissimilar. Ms Shaffer was born in the 1920s and happened to visit Guernsey right after the War. So she genuinely was an author struggling with her current book who got distracted by the history of war-time Guernsey. It gives it a nice ring of authenticity, I think. You might have gathered by my subtle hints, but I’m rather fond of this book. I know, I hid it well, but it’s true. I tried to write a balanced review, I really did, but there is quite literally nothing negative to write about this book. I adore it and I think I might give in to my inclination and just nuzzle the damn thing. I'm reading 84, Charing Cross Road at the moment and it's such a lovely read. I own this one as well, I really should read it soon. @Belle – Oh no! And to think I used to respect you! Haha, I'm kidding (I think) but they're both brilliant yet short books. So good! @Sam – Hi Sam, thanks for dropping by 🙂 I adore 84 Charring Cross Road. It's easily one of my favourite books. This one really is very, very similar though.